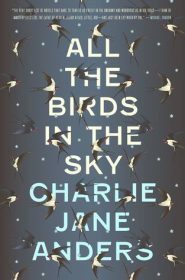 I started reading All the Birds in the Sky by Charlie Jane Anders while I was getting new tires put on my car and when they finished in under an hour, I was annoyed. I loved the 50some pages I had read and didn’t want to stop. I felt that giddy excitement as I continued with the story, but midway through it slowly started going downhill. I still don’t quite know how I feel about it, but maybe when I finish writing this I’ll have a better idea. 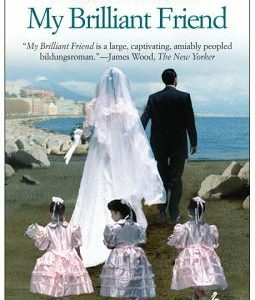 At the beginning, I loved Patricia and Laurence, two young kids trying to figure out their talents. Patricia’s involved magic, Laurence’s science. Patricia’s magic starts unexpectedly, when she was young and lost in the woods. The birds start talking to her to try to help her and they tell her she’s a witch. But almost as soon as she starts talking to birds her magic disappears and she drives herself crazy trying to get it back. While Patricia was talking to birds, Laurence was trying to build a supercomputer, an artificial intelligence that could feel and respond like humans. He’s also skipping school to watch a rocket launch because he’s all about the science, which concerns his parents. They think he’s indoors too much, and this is where his friendship with Patricia begins. Patricia and Laurence are outsiders for different reasons but come together to help each other. Patricia helps Laurence lie to his parents about amazing outdoor excursions they take, like climbing trees, playing with baby animals, and whitewater rafting. Laurence helps Patricia by not judging her as she talks to him about her mission to regain her magical abilities. This is what I love most, the interaction between Patricia and Laurence. Or, actually, what I really love is Patricia. She’s the most adorable thing ever making up elaborate, imaginary outdoor excursions she and Laurence tell his parents. It’s priceless, really, but what’s also great about Patricia is how she interacts with her sister and parents. Both Laurence and Patricia have awful parents who don’t support them, with Patricia often getting locked in her room. Her sister brings her food, spiked with all sorts of disgusting things, but Patricia never falters. She’s smart, witty, and courageous and I loved her. But midway through the book, Patricia and Laurence grow up. In their late 20s (maybe early 30s? ), they have grown into their talents, with Patricia being an amazing magician who helps people, and Laurence working for a tech company bound on changing the world. It’s magic versus science and they collide when the sides don’t agree on how to fix the world, because, oh yeah, climate change has messed us up. Oh, and there’s an assassin who has been trying to kill these two since they were young because he envisioned these warring sides in some mystical assassin retreat in the mountains. Yeah, I didn’t mention that part because it’s pretty much as dumb as that sounds. Anyway, back to the story: they’re older, they’re on opposite sides, and I just didn’t enjoy it. Part of it is probably because we get to know them really well when they’re young but not when they’re older. They haven’t seen each other in awhile, but randomly run across each other at a party in San Francisco, and then they start seeing each other all the time, even though there’s really nothing about them that seems like they’d actually be friends as adults. But I don’t think that’s the full reason I didn’t love this either. There are also some issues with worldbuilding. I wanted to know more about the effects of climate change, which is sort of outside of their world, even though they’re working to fix it. It seems like they’re above all the bad stuff that is randomly mentioned here and there. I needed to see more of it happening to them instead of people they know who live thousands of miles away. 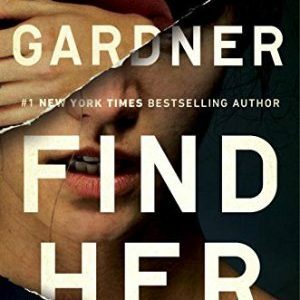 So even though I just went on about what I didn’t like, I honestly didn’t think this was horrible, but I was so pumped at the beginning and felt deflated by the end. 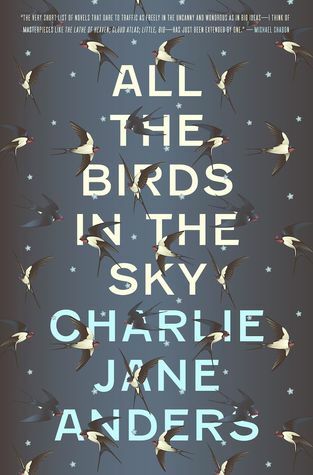 It just didn’t continue to keep me interested and I’m bummed, but this is Charlie Jane Anders’ first book and I really enjoyed the writing style, so I will watch her to see what she comes up with next.